A complete flint scraper of Mesolithic date (9000-3450BC). The lithic is sub-rectangular in plan and concaveo-convex in section. The dorsal surface contains 4 predominant negative scars with corresponding arises. The distal, right and left hand edges show short, parallel, semi abrupt retouch. The proximal end has been abruptly blunted. The ventral surface is concave and predominantly smooth with percussion ripples emanating from the proximal end. 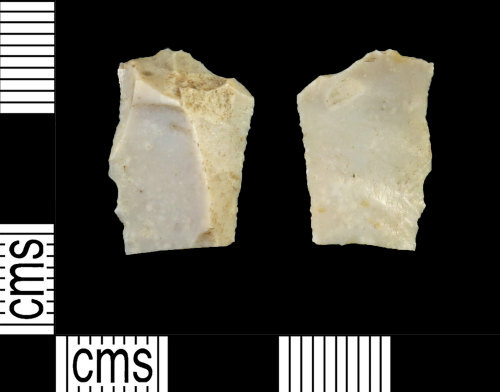 The lithic retains no cortex and is therefore a tertiary flake. The flint is a cream in colour with lighter inclusions throughout.